MARIUPOL, Ukraine -- The morning routine begins promptly at 8:05 at Public School 68, with a round of calisthenics followed immediately by the daily shelling drill. 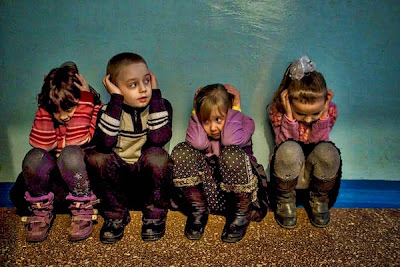 Students at Public School 68 in Mariupol during their morning shelling drill on Friday. A bell clangs on the loudspeaker, and unsmiling children pour out of classrooms in perfect formation, knees bent, heads down, squatting along the thick corridor walls far from any windows, hands clamped over their ears. “They don’t think it’s something funny,” said Elena Klemanchuk, whose fourth graders huddled in the gloomy hallway near a mural of a girl skipping rope. With the battle for control of the crucial railroad town of Debaltseve nearing what seems to be its climax, the focus of the conflict in eastern Ukraine is shifting southward to Mariupol, an industrial port in government hands where the pro-Russian rebels are massing their forces. “You can feel a fear and anxiety in the air,” said Yuri Hotlubey, the mayor. While rebel rocket attacks on Tuesday killed at least seven civilians in Kramatorsk, about 30 miles north of the front lines, the leaders of France, Germany, Russia and Ukraine were scrambling to arrange a summit meeting in the Belarussian capital, Minsk, on Wednesday to try to halt the fighting and establish a demilitarized zone. In the months after a shaky cease-fire was declared in September, Public School 68 had 745 students. Then, on Jan. 24, a salvo of Grad rockets hit the school’s crowded neighborhood on Mariupol’s east side, battering a market teeming with Saturday morning shoppers and leaving 31 people dead and dozens more wounded. Many frightened residents fled, leaving the school’s enrollment at 432. “Before it happened, everybody told us we had three lines of defense and we were perfectly safe,” said Victor Perkov, the head of the school. Ukrainian military officials said on Tuesday that national guard units had begun an offensive against rebel positions near Mariupol. A spokesman for one volunteer unit, the Azov Battalion, claimed that it had captured the small towns of Shirokino and Pavlopol just outside the city. The fighting continued around Debaltseve as well, with the rebels claiming that they had surrounded the city while the Ukrainian Army insisted that the battle was not over. In a new wrinkle, artillery shells fell 50 miles to the north at Kramatorsk, which had not seen any fighting in months but where the government has a sizable military base. Mariupol is a bustling port in a strategic location on the Sea of Azov, near the Russian border. The rebels control the territory to the north and east, and Russia controls the Crimean Peninsula to the southwest. Mariupol is the only major obstacle to their realizing a long-held goal of opening a land route between Russia and Crimea and taking complete control of the Sea of Azov and its rich industrial infrastructure. Russia, which denies playing any role in the conflict here, says it has no such intention. Even so, Mariupol has been a target almost since the fighting began early last year. The rebels briefly took control of it in the spring, and it was the scene of fierce fighting in the late summer, when the rebels drove to within 10 miles of the city limits. “In September, Mariupol was very weak and poorly defended,” said Andrey Dzyndzya, who was a prominent activist during the protests that toppled Ukraine’s previous, pro-Russia government and is now a fighter with the Azov Battalion. “There was a kind of panic in the city,” he recalled. But he and other local military and government leaders said the situation was different now, with a complete ring of defensive lines, rather than just positions on the main roads. “I feel confident that we have enough troops and enough weaponry in place to successfully protect the city now,” Mr. Dzyndzya said. On an icy stretch of beach just east of the city center, another volunteer group, the St. Mary’s Battalion, was holding training exercises, teaching new recruits to move in group formation. The recruits were in crisp combat gear but had no rifles. They moved along the beach holding imaginary weapons, like a military version of air guitar. One by one, the fighters jumped over a seaside bench and somersaulted into a prone position on the wet sand, pointing their invisible guns toward a thatched cabana. The young soldier leading the exercise played a battle theme from “The Lord of the Rings” on his smartphone. A half-dozen black puppies scampered alongside the crawling troops. A trio of civilians watched from nearby, smoking and chewing on sunflower seeds. “It is a public beach,” Vitaly Filipchuk, the headquarters commander for the battalion, said with a shrug. At a jam-packed meeting at City Hall that morning, civil defense leaders and police officials discussed how they might alert residents in case of a rebel assault in a particular area. The city’s siren system, built in Soviet times to warn of a nuclear attack, can be used only citywide, not neighborhood by neighborhood. Could they use online social networks? What about loudspeakers on cars? Perhaps instructions on what to do could be printed on the backs of utility bills? No decision was reached, and the question was put aside for further consideration. “We do not have a practice on what to do in the event of an attack,” said Mr. Hotlubey, the mayor, after the meeting. North of the city, at the last checkpoint before the front lines, Grigory Lohvinenko, the checkpoint’s commander, stood in deep mud and pointed out the rebel positions about four miles away. He ticked off a shopping list of matériel he hoped the United States would give to Ukraine — updated equipment, more accurate artillery, anti-tank weapons. “And we would not mind a couple of drones,” he said. At that moment, a woman drove up in a silver Subaru station wagon and waved to the troops. The woman, Natalya Radkevich, said she came out to the checkpoint once a week. She began unloading containers of homemade borscht, vegetable salad, cookies and candies, sponges and wet wipes for the soldiers. “They are our heroes,” she explained. At the Denis Market on the city’s east side, named for the owner’s son, the crowds were sparse. This is the market that was hit in January, and signs of the shelling are still evident in the battered roof, the piles of broken glass and the new bricks shoring up the hammered walls. More than 70 percent of the shops in the marketplace remain closed, according to Vadim Yedvokimov, the owner. At least half of the neighborhood’s residents have fled. Will the market come back? “Of course,” he said with a sad smile. Across the street, a crew of sign painters was refreshing the markers that point the way to the nearest bomb shelter. Ms. Klemanchuk, the fourth-grade teacher, said she had been at the school on the Saturday morning the market was hit, leading an orientation group of preschoolers, all 5 years old. “They were very scared,” she remembered. “Many of them were crying. I tried to calm them down. She paused and took a deep breath, looking down the dark hallway at the children squatting on the floor with their ears covered. “But they said no, they did not believe me,” Ms. Klemanchuk continued.